Tags: idle, champions, early, access, update, event, midwinter, regis, k'thriss, c team. As the citizens of Longsaddle celebrate Deadwinter Day by exchanging gifts, the Champions have once again been hired by the Harpells to patrol the outskirts of town. Midwinter 2 runs until Monday, January 28th, 2019 at 12:00pm PST, introduces K'thriss Drow'b, Drow Warlock of the Great Old One, and also brings back Regis, the Halfling Rogue! K'thriss is an unusual Support Champion. 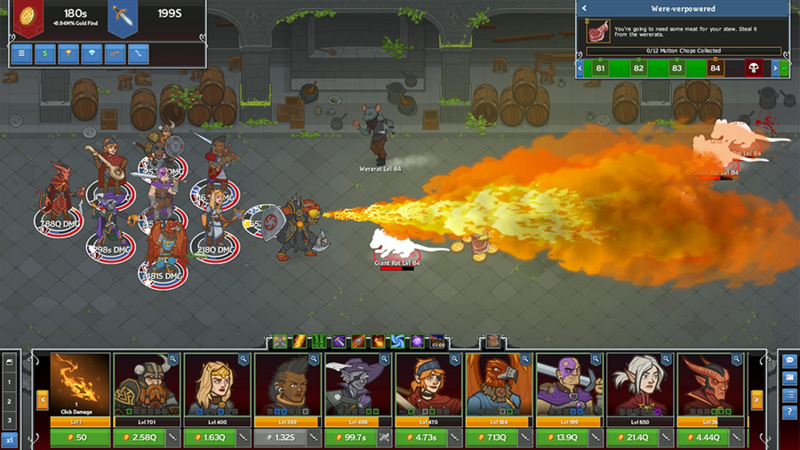 He reduces Gold Find to increase Global DPS, summons Shadow Demons to assist the party, and buffs distant allies. 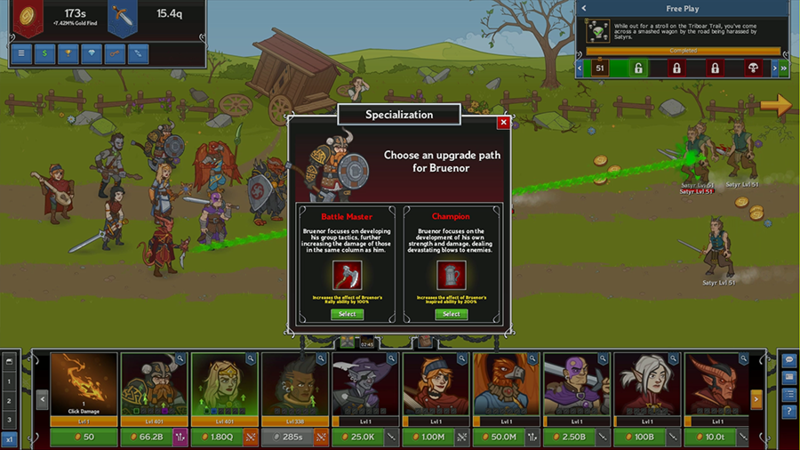 When you want to add K'thriss to your party, you can swap him with Bruenor (Slot 1). 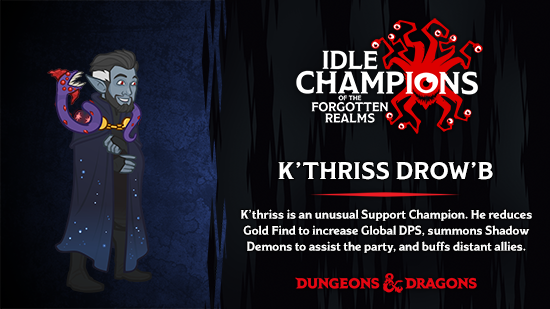 For more information about our latest Champion, check out the Idle Champion Spotlight: K'thriss dev blog! As a poor urchin on the streets of Calimport, Regis quickly learned that survival often requires bending the rules in your favor. He fled to the north to avoid capture after stealing his former master’s magical ruby pendant. Eventually, he found companionship amongst the Companions of the Hall, becoming one of Bruenor Battlehammer’s most trusted confidants. Bruenor was the one who gifted Regis with the nickname “Rumblebelly” due to the halfling’s insatiable appetite. Regis would prefer nothing more than to relax in the sun with a full belly near his home in Ten-Towns and fish for knucklead trout, the source of all of his scrimshaw carvings. But when his friends need help, Regis is always there for them. He never sees himself as the hero, even though his true friends know better. Regis is a Support Champion. He uses a magical ruby amulet to buff Champions in front of or behind him, and to make enemies weak to different types of damage. When you want to add Regis to your party, you can swap him with Celeste (Slot 2). 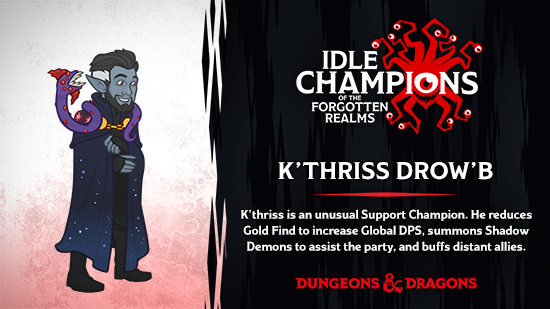 Velvet's Midwinter Adventure — K'thriss summons his unseen servant, Velvet, to help with party. Unfortunately, Velvet has been tasked with collecting gold for K'thriss, causing enemies to drop 50% less gold. 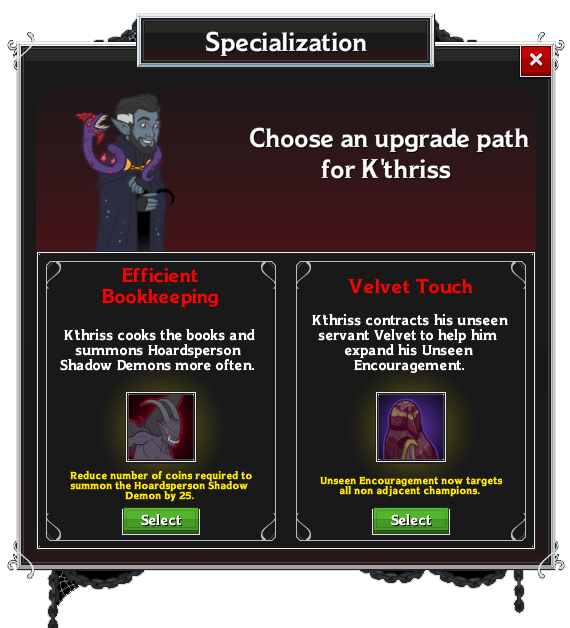 K'thriss and Velvet both start in the formation, and once unlocked, K'thriss' Unseen Encouragement ability extends from both K'thriss normally, but also extends to those adjacent to Velvet. Truth Beyond Knowing — K'thriss desires more knowledge of his unknowable god. 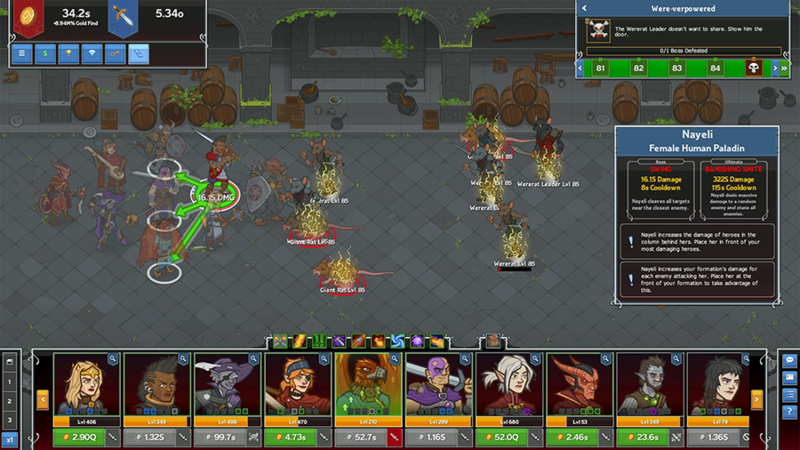 Every area, a Drow Cultist empowered by the sign of the Ur appears, attacking with Chain Lightning. 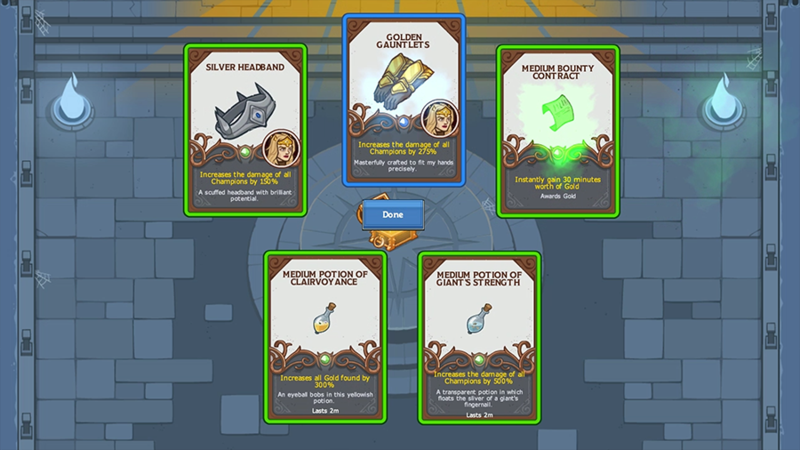 The Drow Cultist drops no gold upon death, but does drop a glyph (book). Every time you collect a glyph, Champions with an Intelligence (INT) score of 13 or higher have their damage increased by 5%, while Champions with below 13 INT have their damage go down by 5% for the remainder of the adventure. More Like the Scream Team — The Devourer now arrives as a second boss in Area 25, and if that wasn't scary enough, the Devourer now devours Champions every 8 seconds instead of every 10 seconds! Deadwinter Date — You've been tasked with escorting two young Harpell wards on a date during your adventure. They take up slots and are otherwise pretty useless..
Deadwinter Fey — A large number of sprites and pixies spawn with each wave of enemies (not during boss areas). 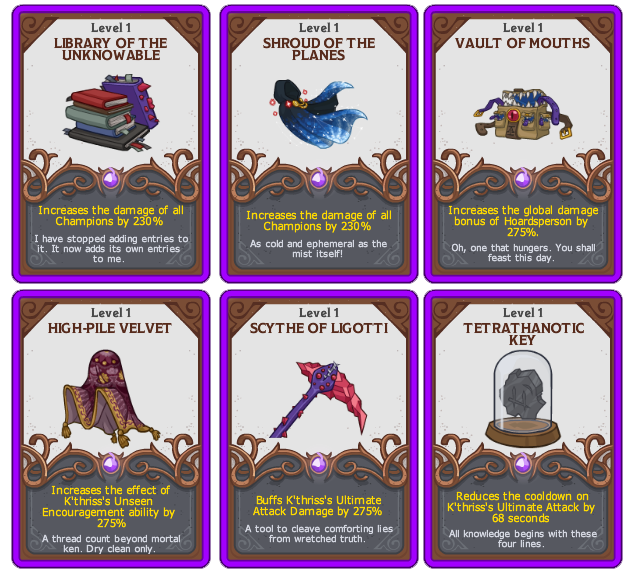 These extra monsters do not drop gold, and when killed they sprinkle a random Champion with pixie dust. 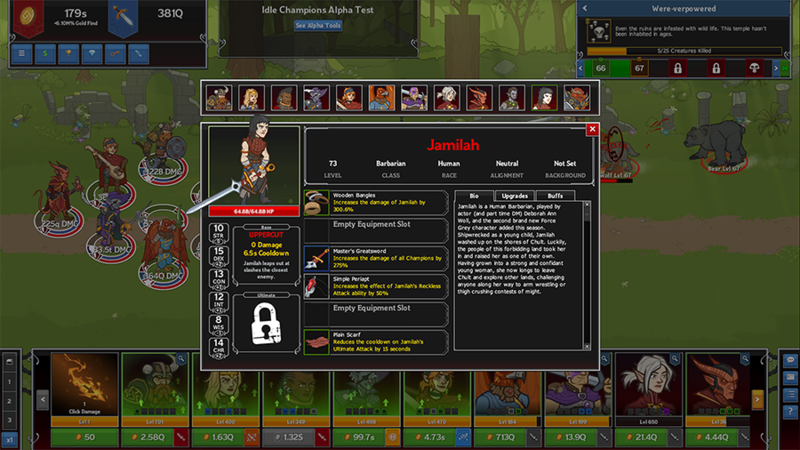 Any champion that is sprinkled with 10 Pixie dust has their DPS and Formation Abilities disabled. Pixie dust stacks reset when you change areas. Deadwinter Pay (-back) — Every time you defeat an enemy (in a non-boss area) your Champions take 10% unavoidable damage. 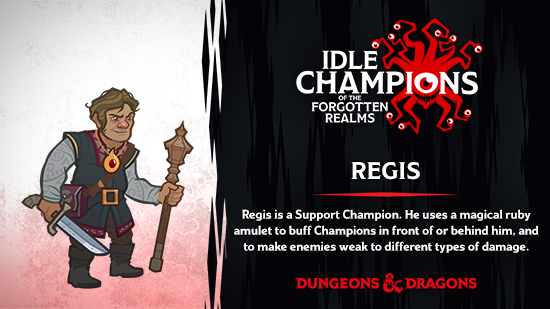 Champions adjacent to Regis take one third of that damage while Regis himself is immune.